Do you remember the jewel-encrusted Kuhn-Bosendorfer grand piano we featured four years ago, with the speculation that it was the world’s most expensive? This exclusive limited edition grand piano has now concluded a round of limited concerts and showings and is being put on the open market. That is, the open market for the kind of person who has just shy of a million dollars lying around. 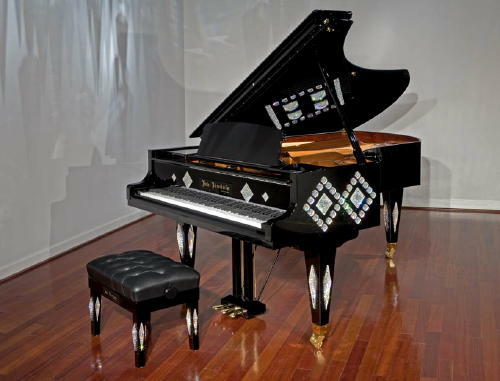 Based on the Bosendorfer Model 225 grand piano, artist Jon Kuhn has added 200 crafted optical grade crystals into diamond patterns on the case, lid, fallboard and bench. Originally valued at $1.2m, it has now been appraised at $800,000 and is being offered on a first-come-first-served basis. What a cool $400k saving, eh?